What is a medium (plural media)? Any preparation that contains nutrients essential for bacterial growth , is called a medium. medium. 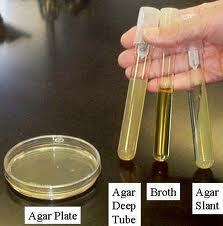 culture medium may inhibit growth of one type of bacteria and it may facilitate growth of another type of bacteria. In other words a culture medium can be selective in nature. What is meant by Inoculation Of Media? It means introduction of infected material to the medium for the cultivation of organisms present in the material. 1. According to physical state. a) Liquid media: fluid in nature, usually placed in test tubes, for example nutrient broth. b) Solid Media: Prepared by adding solidifying agents like gelatin and agar to the liquid medium, for example, nutrient agar. a)Simple Media: it contains only basic substance such as nitrogen , carbon and minerals that are essential for bacterial growth, for example, nutrient broth, nutrient agar, peptone water etc. b) Enriched Media: Some nutritionally enriched material like blood, serum or asctic fluid is added to the medium, repuired for proper growth of some bacteria, for example, blood agar, chocolate agar. d) Selective Media: In this media an inhibitory substance is added to the media which prevents growth of all organisms except the one for which it is designed. for example, Lowenstein jensen's medium. e) Media used for biochemical reaction: This media is used to detect different biochemical reactions produced by different organisms. for example, simmon citrate medium. how about classification according to application or use?